An airfoil would probably be unique, and you'd have to be an aeronautical engineer or aviation history nerd to get it, which is cool... But, frankly, i think if you want the alpha symbol you should go for it. It's your project, make it perfect for you. Sent from an over-caffeinated state via Tapatalk. eljay and Mikavulin like this. I really, really like what you're doing here. The new set of hands is the tops. Keep at it! Brekel and Mikavulin like this. Phenomenal build! Thanks for sharing and I will echo the sentiments in the thread that I would wear that in a heartbeat. Excellent work! Great work!!. Suscribed to this thread. Go for a Kickstarter campaing!!!! "Borders?. I have never seen one. But I have heard they exist in the minds of some people". Thor Heyerdahl. Mido Ocean Star Captain/ Crepas Cayman/ Crepas L'Océan/ Crepas Decomaster/ Crepas Tornado/ Orient Poseidon/ Seiko Dojo/ Orient Mako/ Seiko Monster/ Zeno Army Diver LE/ Magrette Moana Pacific Diver/ Magrette Regattare Brass/ Magrette MPP Steel/ TACTICO Anko/ Orient M Force/ Luxmento Naylamp 300m/ Seiko SRP777/Amphibia 50th Anniversary Bronze. Certina DS 1960/ Certina DS2 1970/ Seiko 6139/ Eterna KonTiki 20. Luxmento Naylamp/ Glycine Airman World Traveler/ Pulsar PSR10/ Pulsar PSR20/ Pulsar G10/ Bertucci A2-T Highpolish. We have a new crown logo! Gryffindor, Jpfahrstar, TimeOnTarget and 3 others like this. I would love to wear this design in a standard 3 hand config, or with a gmt function. Very nicely done. Looking good. Although I dont fully understand the function of the chrono pushers. 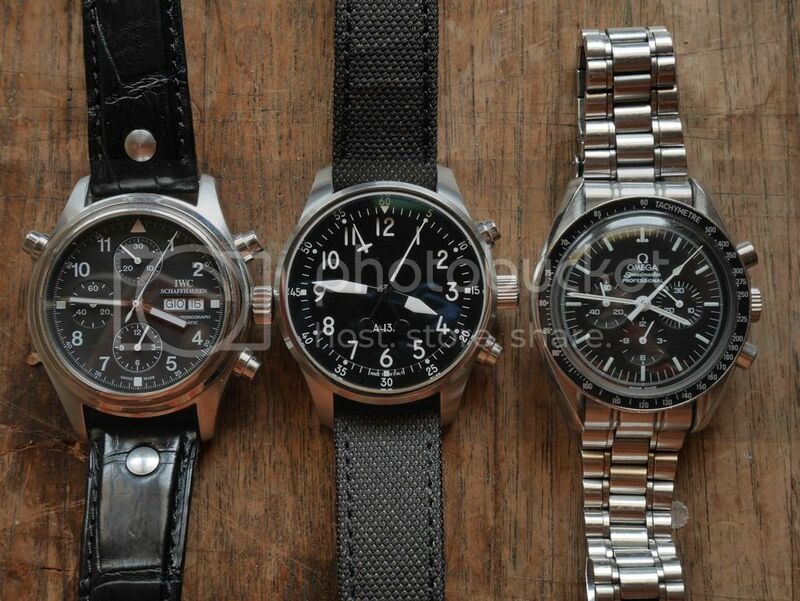 I also dont know why it needs to be lemania to be perfect pilot watch. But thats me. If i understand it well, is it a chrono that only counts minutes with its chrono hand? The watch displays current time in hours and minutes while chrono shows only minutes and seconds. However let me very briefly address the excellent Diablogt’s comments. First of all a pilot watch is a navigation tool and the panel clock A-13A has been designed to fulfill this basic requirement. Even if today everybody relies on GPS, inertial platform, radio navigation etc., the principles of basic, low level, VFR navigation are fundamental for any pilot. Let me also say that this type of “basic” navigation is actually a kind of art since the pilot has to calculate, estimate, check the progress of his/her navigation based only on the “estimated” information provided by map, speed, time and heading. That means that the minimum assets for aircraft navigation are a map, a compass, an airspeed indicator and, of course, a watch. Books have been written on the art of the estimated navigation, but in an oversimplified way it works like this. Have a look of the photo below. You split your route from the departure to destination in several legs. Each leg, like the one above, begins and ends with turning point (in my case a small city and the conjunction of 2 big rivers). Then, given your estimated ground speed, you divide the leg in minutes of flight, one notch per minute. 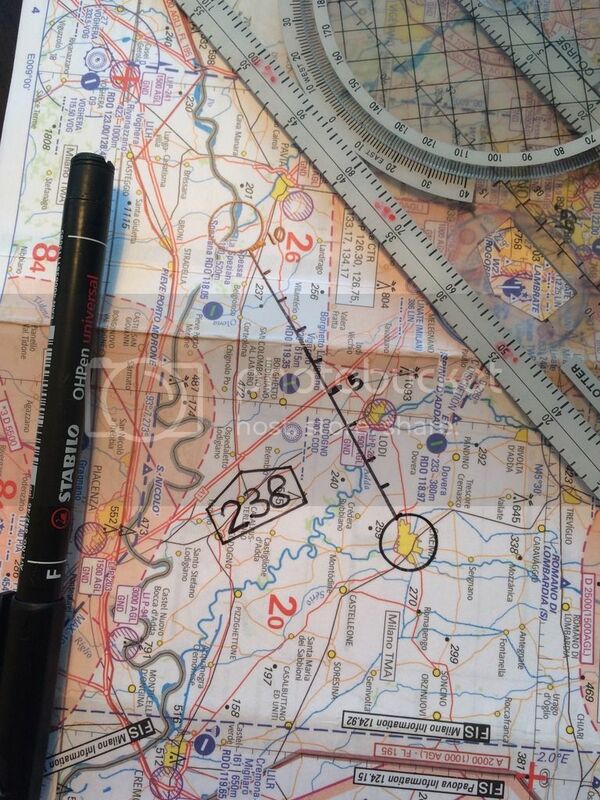 A smart move is then writing close to the leg its the magnetic course (238°). And finally 11 minutes after leaving the initial turning point you will be at the two rivers intersection ready to stop your chrono, set the new route to the next turning point and start your chrono again. All the above observations will of course keep you on your route, but will also provide you information on the influence of the wind and on your navigation errors so that you can compensate their effects. Basically while flying you compare your actual position with the theoretical position you should be at that time of the flight and, if required, you make adjustment. It's a back and forth process and as you can see reading your chrono minutes is fundamental. That's the reason why the hand of the minutes is so important. In flight you monitor your watches much as much as your heading, your speed and you map. So, like anything else in the cockpit, you need that unmistakable clear and error proof. 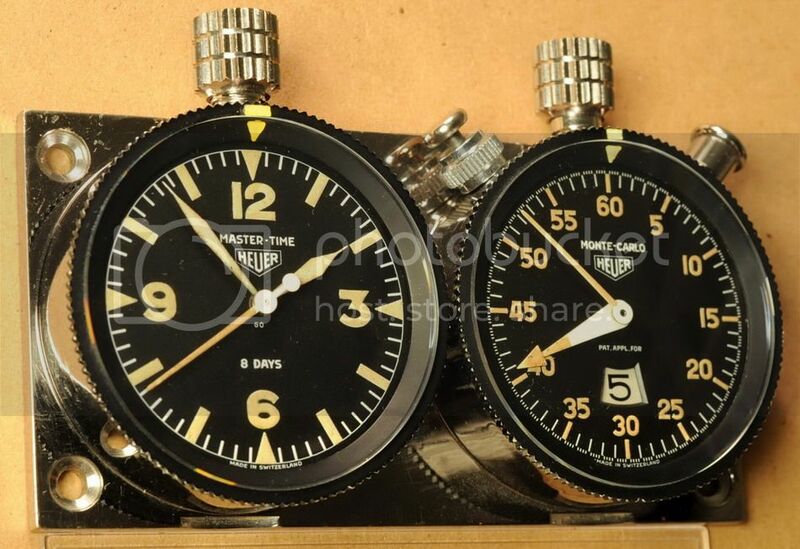 The purpose of the following photo is to compare how the same elapsed time looks in a central minute watch and in two of the most exquisite pilot watches equipped with the minute chrono sub dial. It’s interesting to report here another application of the central minute hand aircraft clock: the dash board clock used of rally competition in the sixties and seventies. It looks like rally pilots came to the same conclusions..
LF78, heyheyuw, Hunterfate and 12 others like this. Very nice design! I love the concept. I find inset chronograph dials slow to read when flying, having the chronograph minutes counter central would be great. I hope you offer these for sale.